A subscription that provides complete protection of your unlimited number of devices. All units, be it a computer, a smartphone, Ultrabook ™ or tablet, are fully protected. Whatever the device or combination of devices you may use, McAfee LiveSafe service makes it easy to protect, manage and control the work of all of these devices with a single Web site. 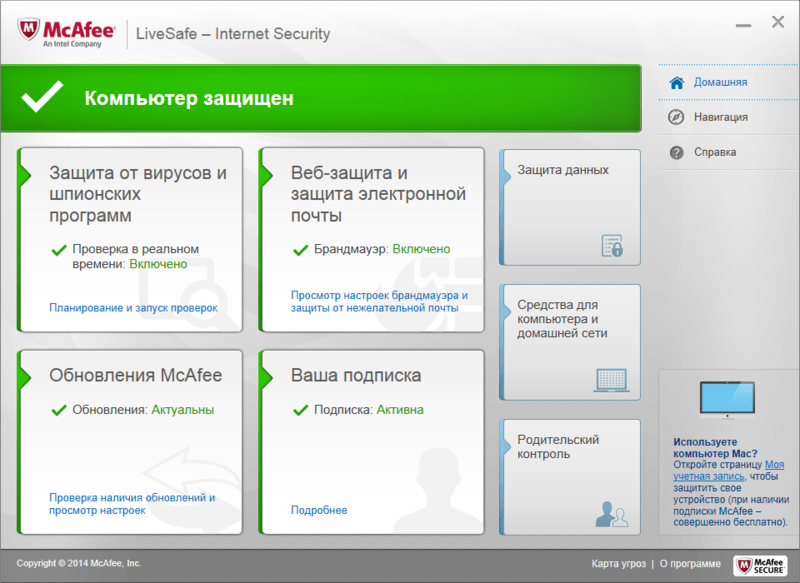 You buy McAfee Life Safe official activation key for 1 year. Validity period starts with the activation of the card. The key you receive immediately after payment in the browser window that opens after the payment. Also, duplicate links to a page with a key will come to your e-mail specified at purchase. If for some reason you can not see the product page - visit oplata.info. At this address all the items you purchased are securely stored and you can always access them after the purchase.